In January 2013 the Government Office for Science published the results of a year-long Foresight study on Future Identities. It was led by Sir John Beddington, the Government Chief Scientific Advisor. One of its main conclusions was that people’s identities are likely to be significantly affected by technology over the next 10 years due to the emergence hyper-connectivity (afforded by smart phones and similar devices), the spread of social media and the increase in online personal information. People now have multiple overlapping and not necessarily consistent identities and they often express their identities through membership of social and professional groups, often not being aware of conditions of use, or ownership, or that some organisations may use information intended for social use for vetting purposes. What is clear is that digital identity and digital personhood are playing increasingly important roles in our lives and that we are not fully aware of the implications of their potential use, creation, ownership, exploitation or control. a)	Overcoming barriers to the expression of digital identity. b)	Curating personal, digital narratives and memories. c)	Physical proxies of digital self: connecting the digital and physical world. d)	Multiple, digital projections and online identities. e)	Understanding how citizens could be empowered by utilizing the value of their digital self. The Digital Personhood Network will facilitate collaboration across all of these and other relevant research projects in order that can they maximise their collective impact. A series of open meetings will be held that will include other relevant stakeholders and will allow projects to share and benefit from each other’s results, expertise and contacts. hese meetings will also allow the participants to develop a common view or ‘map’ of this emerging research area and its associated societal challenges. This ‘map’ will help aid public understanding of the different aspects, contexts and issues concerning Digital Personhood. It will allow the results from the projects to be quickly located via the Network’s website and applications which will be similarly structured. Finally we expect that it will inform and structure discussion of the issues and area at government and funding council level. In collaboration with the Universities of Dundee (lead), Surrey, and Northumbria. We have yet to experience a complete lifespan in the Digital Age, from conception to death in old age. Those who have grown up interacting with digital technology from a very early age are still young, whilst older technology adopters have identities that pre-date the Digital Age, populated with paper trails of memories. Many citizens have only a limited awareness of the permanency and consequence of posting in public and extended social circles. Digital posts from student or teenage years reflecting opinions or behaviour that seemed socially appropriate at that time may not reflect well in future professional life. Digitally mediated interactions produced in life may develop an undesirable perspective if they linger after physical death. The lifelong digital trails generated through our digitally mediated interactions, including online, echo our ‘offline’ lives, but unlike a physical life, the Digital Lifespan can persist indefinitely, and the rich personal context it provides can be harnessed in ways an individual might not expect or desire. these insights, we will first chart the unmapped territory of the “Digital Lifespan” as it is now in the UK, exploring the ways in which virtual and physical aspects of our lives converge, diverge and clash. This chart will be grounded in a series of in-depth studies with UK citizens at four transition points in their lives: approaching adulthood, becoming parents, retiring, and bereavement. The chart that we create will guide us as we look into a future where citizens increasingly live out their lives through digitally mediated interactions. We will explore the implications of this future with individuals, policymakers, legislators and industry representatives. The knowledge and insight developed into issues surrounding ownership and management of citizens’ Digital Lifespans will be used to raise digital literacy. New technologies will be designed and developed, bringing personal digital content together in one place to create a far richer picture than that afforded by currently available tools. Our new technologies will automatically draw out the personal context of such content, making inferential links and distilling the impressions that citizens present of themselves through digital media. These distilled impressions will be reflected back to individuals, raising digital literacy by promoting awareness of how individuals’ digital identities are (or will in future be) represented online over their entire lifespan. Further these novel technologies will equip citizens with ways to manage the impression that they give. Beyond individual citizens, our work will inform educators, policymakers and legislators providing a deeper understanding of what it means to live as a UK citizen in a Digital Age. In collaboration with the Universities of Surrey (lead), Warwick, Exeter, and Cambridge. The business press is alive with considerations of how the ‘Big 4’ tech giants, Apple, Google, Facebook and Amazon are challenging to become the single biggest provider of digital services. In business services there is intense competition between IBM, SAP and Oracle to provide ‘knowledge solutions’ and in B2G there are the challenges of ‘assisted living’, privatisation of education and healthcare and the Big Society’ agenda. Looking to the near future the development of the ‘internet of things’ will increasingly provide information on objects and their location, their physical properties, how long they have been there, what they are being used for etc. This data, increasingly available on global platforms, enables individuals, social enterprises, public and private sector organisations to ‘interact, communicate, collaborate and share information’ in novel and progressive ways. (RCUK 2012). These platforms also have the potential to disrupt current economic structures radically, threatening established players and providing many opportunities for new entrants and new economic models (RCUK 2012). This new environment raises a number of questions, eg to what extent will the digital revolution transform the whole economy, or will it be primarily limited to specific sectors for example information services and in what ways does the Internet enable or hinder trust between parties. Other challenges include the development of ‘off the shelf’ business models that are appropriate for different contexts eg start-ups. Perhaps most important of all given the potential for widespread availability of data on individuals and things, we will consider what is the balance between enabling customised and bespoke services and the issues of privacy and confidentiality, data integrity and security? Private sector organisations. These organisations need to be aware of the opportunities and threats emerging from the digital economy and need to be capable of reconfiguring their organisations to meet the strategic challenges. Consultancy organisations. These organisations need to engage in the long term challenges to their client base faced by the development of multiple platforms. This includes the development of enhanced analytics. Public sector and local government. This sector needs to engage in the opportunities offered by new economic models of partnering with private sector organisations, social enterprises and the customisation and personalisation required by customers. Our vision is that at the end of 3 years we will have established an internationally leading community which has addressed these big research questions and challenges. It will have worked closely with both private and public sectors and engaged with policymakers to help enable an environment where organisations are better placed to take the opportunities offered by the digital economy. This project will provide new ways of viewing EPSRC’s ICT (Information and Communications Technology) portfolio to enable researchers, EPSRC staff and other stakeholders to better contribute to ICT strategy. The project is divided into two main stages. The first will develop new ‘Perspectives’ on the current portfolio based on existing ‘Grants on the Web’ data, the second will use spinout workshops to kick-start the use of the Perspectives and provide feedback on best practice from cross-ICT meetings. In the first phase we will use text mining and simple visualisation techniques to provide ‘at a glance’ overviews of the portfolio in the form of word-clouds or similar intuitive presentations. All terminology will be derived from the community, either from the grant summaries and titles or by canvassing the community directly. The ‘at a glance’ views will also provide the top level of an intuitive navigation system which will allow users to rapidly drilldown to project and investigator descriptions using the natural structure inherent in ‘Grants on the Web’ and derived using text mining. As well as being viewable on the web these Perspectives will also be available as a set of standalone materials and associated tools for ICT strategy and Network workshops. They will provide an accessible overview of the portfolio and its natural structure. The latter will be presented in interactive dendrogram form to allow easy partitioning for scoping more detailed workshop breakout sessions. The second phase of the project will focus on networking. Six ‘spinout’ workshops will be organised by open call that will make use of Perspectives’ materials and tools to facilitate brainstorming and road-mapping type activities. Meetings that bring together two or more Networks will be especially sought. Voice Report 2013 – Executive summary and state of the art in speech to text technology report. This project aims to produce a demonstration search interface for multimodal meeting data as proof of concept. The motivation lies in the industry need for better methods of recording and retrieving rational behind decisions made in meetings. Companies that undertake large projects with extensive design phases often find that later in the life of the project, the reasons behind decisions and changes to these decisions can be hard to uncover. This problem leads to lost time in trying to rediscover this rational, and often lost money in decisions being wrongly overturned. As technology to capture multimodal meeting data (audio, video, transcriptions, CAD, slides) becomes increasingly reliable we are now need to be able to organise and browse this data efficiently and intuitively. The search mechanism and interface being developed for this project will use the AMI meeting corpus. This is a collection of 100 hours of multimodal meeting data, with extensive time stamped transcriptions and annotations. Using Topic Modelling on the meeting transcriptions will allow for more powerful searching of the corpus. Topic Modelling allows us to uncover the hidden thematic structures of the corpus, showing what topics make up each document, and how these documents are linked semantically. A user could use topics to retrieve relevant recorded meetings, and browse these meetings using a rapid indexing system. This will allow users to quickly find points of discussion in past meetings that may be relevant to decisions in current meetings, and inform important decisions. We aim to produce an intuitive interface that graphically represents both topics and relative points in a meeting, in a way that enables users to browse the meeting corpus with ease. We aim to provide manufacturers with systems that will allow their staff to rapidly capture inspiring textures, to efficiently and intuitively browse texture catalogues for complementary and contrasting examples, to be able to rapidly combine and modify these surfaces in new designs and then to be able to ‘visualise’ them through interactive haptic and audio-visual means. Above all the tools and systems developed within in this project must be user-centred and by that we mean they must have natural and above all intuitive interfaces derived using quantitative psychophysical experiment and analysis. We expect to produce technology and methodologies that would aid the rapid design and visualisation of texture critical goods and products such as: soft furnishings, car interiors, wall/floor/ceiling coverings, exterior cladding, all of which are now being manufactured to demand in small volumes for specialised and custom markets. The goals of this project are (a) to enable Scottish Museums and other leading public institutions that have important and irreplaceable archives to create, maintain and develop visually rich, online catalogues of highly interactive media that showcase their collections and enable wide and free access to our cultural heritage; (b) to use (a) to publicise the use of this technology to help spread it to other sectors such as contemporary art and crafts and science and technology (e.g. EPSRC’s Impact website). We would provide sample ‘catalogues’ of ten-twenty artefacts per institution in order to bootstrap interest. However, our aim would be to facilitate and encourage existing staff to create the shoogle digital media directly and would particularly target existing digital media and photography staff by providing short (1 hr) training courses in the use of the shoogleIt web application and the production of suitable digital source material. In collaboration with the University of the Arts London (lead), Imperial College, and UCL. The sensorial experience of products in the digital environment is a much neglected area. Consumers’ perceptions and attitudes towards products are formed and changed daily through interaction and experience with goods and services. A new language to communicate sensory stimuli has the potential to enable consumers to capture digitally their perceptions of products and use them to create value. With changes in consumer demand – namely that it is more complex and diffuse; with consumers demanding products that provide scope for greater personalisation, and that fulfil emotional needs – comes a need to gain a better understanding of consumer sensory preferences on levels hitherto unseen. Such a sensory or perceptual language would add value to a number of applications: A way to capture new types of market intelligence to help identify gaps in the market and areas for improvement and innovation; more effective communication of the attributes of products in e-retail. This level of knowledge would also support the communication between consumers and designers, perhaps leading to new transactional relationships between them. To do this we need new methods. Through this project we are proposing to give developers and consumers a means to articulate what is difficult to articulate: people’s sensory perceptions of the different textiles commonly used in clothing products, thereby connecting the body to the digital world. Furthermore, we are proposing to explore this unique design space using a set of techniques that are established, but will be synthesised in a way hitherto unseen. Using design as a generative tool we will endeavour to mobilise people’s tacit knowledge about, and new understandings around, sensory perceptions of textiles. We will use physiological sensing technology to obtain physiological responses to sensory materials, obtain self-report from people on those perceptions using generative co-design techniques to produce perceptual labels, and produce rich media representations of those same perceptions to provide the basic elements of our perceptual language. This digital perceptual language will be used as a method to communicate more effectively richer perceptual presentations of products, and to develop semantic tags which people can use to self-organise themselves around in social network web environments. Through these applications we aim to gain insight into: The effectiveness of the perceptual language as a way for brands to communicate rich sensory information about a product online, and therefore, a new method to add value; whether consumers are better able to make more informed choices due to better quality of information about a product, and whether they are better able to articulate what they want. Using semantic and social networking tools we also aim to gain insight into whether there is potential for new transactional and co-design relationships between users and developers/designers (thereby challenging the designer/user hierarchy) leading to new business models, e.g., market research through crowd-sourcing, and collaborative social design; and by extension whether new social and design community paradigms will emerge. We aim to transfer this technology and associated know-how to the UK artistic community so that they may themselves create a highly visible and novel web presence that is accessible via a single hub. The key is to establish enough use and content such that it becomes the de facto way to explore UK contemporary sculpture. Remaining artists and gallery staff will feel they must have an equivalent digital presence – thereby providing a strong motivation to use the onsite learning material and employ the ShoogleIt web technology themselves. We propose to bootstrap interest in the hub by directly training gallery staff to use ShoogleIt to produce interactive content for their websites. The web application will be free to users on the condition that any content generated would be available via the project hub. We would target clusters of galleries in Edinburgh, Glasgow, Manchester and London and aim to train staff in 40 galleries (training takes typically 1 to 2 hours). Out of seven randomly chosen galleries that we have visited in Edinburgh, six said that they definitely wanted to participate in the project and three requested a date for on-site training that week! A typical first reaction was: “Fantastic! The whole idea is fantastic! The concept is a super idea for presentation to clients.” direct quote [Di Rollo Gallery, Edinburgh]. This projects follows the PerTex project (EP/D059364/1), however, it is focused on analysis of reflectance properties of real materials captured in a form of BRDF and BTF datasets. The main objective of this project is to identify perceptual dimensions of surface texture, and to find new computational features corresponding to these dimensions. This will enable the development of novel methods for performing perceptually meaningful measurements of surface texture, which we believe is core to future information service technologies that will provide intuitive and efficient methods for navigating, retrieving, compressing and manipulating such data. While surface appearance is a critical characteristic of nearly all of today’s commodity items, it is striking that there are no accepted methods for measuring the appearance of surface texture, or even an agreement on what the principal perceptual dimensions of surface textures are. This is in huge contrast with colour for example which is known to be perceived as a three-dimensional space, as characterised by the perceptually motivated CIE LUV standard. We propose to tackle this problem using a novel methodology that exploits the established psychophysical techniques of cognitive science and combines these new computer vision models of the Bidirectional Texture Function (BTF) and state-of-the-art computer graphics. Surface appearance is a critical characteristic of nearly all of today’s commodity items and plays an important role in many other aspects of our lives. While internationally accepted standards have been defined for the measurement of colour and instruments are available for the measurement of surface gloss, there are no accepted ways of measuring the complex phenomenon we know as ‘texture’. A small number of studies have sought to develop perceptually meaningful methods for measuring texture. However, we believe that these experiments were significantly flawed by the use of incomplete stimuli and uncontrolled conditions (they employed still photographs of surfaces imaged under unknown illumination conditions). Our proposal differs fundamentally from previous work because: a) we will compute texture measures directly from surface descriptions rather than from images / thereby removing the significant biasing effects illumination, and b) we will use graphics shader technologies to provide real-time photorealistic visualisations of real surface textures / this will provide both rich stimuli for the observers and full control over the psychophysical experiments. We believe that this work is of international significance because it tackles the important scientific problem of providing repeatable methods for obtaining perceptually meaningful measures of texture, and that with the collaboration of NPL and CIE it will establish the basis for national and international standards for texture measurement. The PhoCal project investigated methods and theory for calibrated and uncalibrated photometric stereo. It made three main contributions. Firstly, it is usually assumed that the illumination conditions used to acquire individual input images are known; but recording the light source positions and intensities is difficult in practice. We showed that there is no need for this if as few as two specular pixels are visible in images taken under two different illumination directions. In that case, light source parameters can be computed from the input images themselves. Secondly, an important question to ask in photometric stereo is: given the number of light sources which are to be mounted to a photometric stereo acquiring device, where should these lights be mounted in order that the measurement error gets least propagated to the output? We answered this question for Lambertian reflectance and ANY number of light sources. For the specific case of three light sources, these should be mounted such that their directions are perpendicular. 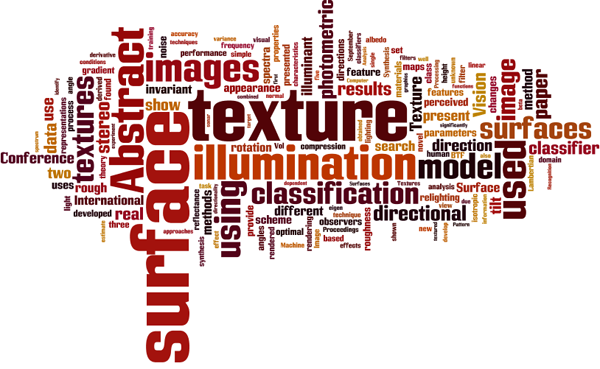 Thirdly, we studied a closely related problem of surface texture recognition under varying illumination. Recognition of general surface textures (surfaces with a 3D relief) under different illumination conditions is difficult because the images are not related by simple scaling (as flat Lambertian surfaces would be). A common approach is to take several (usually far more than three) images of a texture under different illuminations and use these as a learning set for the recognition algorithm. In contrast to this, we analysed the conditions under which the learning set can consist of only a single example of the texture under certain illumination. To test this new approach, we performed experiments on images of real textures, with very promising results. For details of publications regarding this project see “Ondrej Drbohlav” in “people”. The objective of this multidisciplinary research project is to investigate the use of a new approach to the acquisition of three-dimensional surface texture data for augmented reality applications. A particular focus will be the use of such technology for the creation of animated ‘virtual catalogues’ with search facilities, for e-commerce of textiles and design of related products. The work programme focuses on four main research issues. They concern the effectiveness and generality of the acquisition, visualisation and search mechanisms from the perspective of designers and users. Initially we would focus on matte homogeneous materials and investigate the quality of the acquisition process. Self-shadowing and occlusion in high height-variance materials are of particular concern. Matching mechanisms would be implemented based initially on existing rotation invariant similarity measures. These would be based on surface normal data and then extended to include colour pattern information. The last major phase of the work would investigate the use of specular reflectance models for the acquisition, visualisation and retrieval of glossy and satin materials. Texture is viewed as the result of surface roughness and the illumination geometry of a surface. It is proposed that methods based on photometric stereo are used to infer the 3D relief of each textured surface. Three possible scenarios are identified for the classification and recognition of unknown texture: 1. The surface has been imaged under known geometry chosen by us. (This scenario is relevant to industrial applications where we have full control over the imaging conditions). 2. The surface has been under known geometry but not chosen by us. 3. We do not know the geometry under which a surface has been imaged. All three cases will be investigated, using texture descriptors that take into consideration surface gradients and colour, and in the last two cases rely on the synthesis of images of surfaces for a given imaging geometry, from the knowledge of their 3D relief. The variety of imaging geometries considered will be restricted to those that view the surface under the same scale. of all types of three-dimensional surface texture.